This Mumbai Metro will collaborate with multiple NGOs working for the cause of differently-abled, underprivileged kids and elderly people. Mumbai Metro One will be holding a series of fun activities at Andheri, Chakala (J.B. Nagar), Airport Road, Marol Naka and Saki Naka Metro stations as a part of its promotion of Daan Utsav Week. 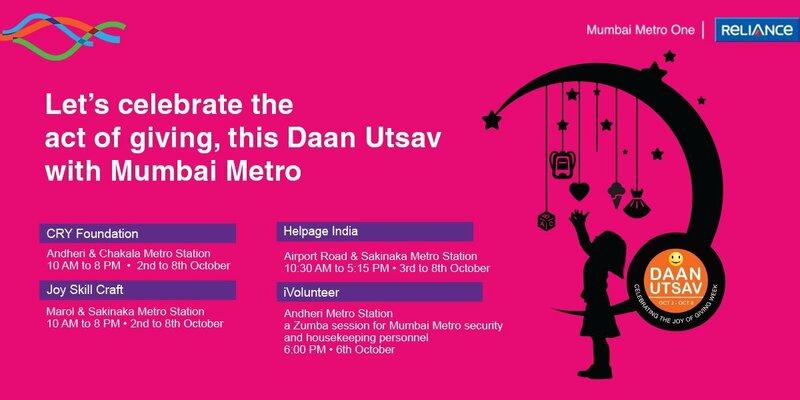 This year Mumbai Metro has partnered with NGOs like CRY, Joy Skill Crafts, HelpAge India and iVolunteer for Daan Utsav. On 6th Oct at 6 pm will be this year’s attraction: a Zumba session specially organised by iVolunteer for Mumbai Metro’s security personnel and housekeeping staff, who can enjoy stress buster moments off their routine schedules. Mumbai Metro will be providing space and necessary logistical support to collect donations from commuters for differently-abled, underprivileged kids and elderly people for their education and healthcare needs. Besides, Mumbai Metro will be doing promotion of the festival by using digital screens, train and station announcements, train posters, social media, live updates and telecast of workshops, Mumbai Metro website, e-mailers to employees, wallpapers and digital banners. The building activities at the stations including innovative games to sensitize Metro commuters about the need to give so that we turn into a more caring society. The commuters will be given receipts for their donations on the spot and later emailed the details of the utilization of their donations by the NGOs.